No matter how many albums Swift shifts, the music industry is never going back to physical sales, like, ever. So the multi-Grammy winning, multi-millionaire pop superstar Taylor Swift wrote in a Wall Street Journal op-ed in July, and her legions of adoring fans duly obliged her. Her latest album 1989 shifted more than 1.3 million copies in the US in its first week on sale last week. No album has sold more than 1 million copies full stop this year, apart from the soundtrack to Disney’s Frozen. That was no doubt helped along by the album not being available to stream on Spotify or any other service. Versions uploaded to YouTube were left there but with their sound wiped - a silent admonishment to any would-be pirates. Fair enough if you’re already famous and can afford to get your record label to police the internet - Swift did the same with her previous album Red, and that also worked wonders for sales. But then the 24-year-old shocked the industry by going one step further and pulling her entire back catalogue off Spotify yesterday. 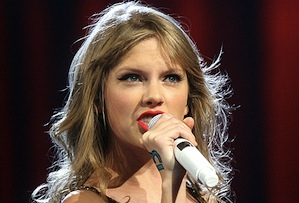 ‘We love Taylor Swift, and our more than 40 million users love her even more – nearly 16 million of them have played her songs in the last 30 days, and she’s on over 19 million playlists,’ Spotify wrote in a blog post in response to the decision, which neither Swift nor her record label Big Machine have commented on. Artists have long moaned about the loss-making Swedish streaming service, which was valued at $4bn (£2.5bn) earlier this year, and the apparently pitiful royalties it pays out. Radiohead frontman Thom Yorke called it ‘the last desperate fart of a dying corpse’ (there plenty of Radiohead songs on Spotify, in case you’re wondering). But Swift’s decision - which will hurt Spotify, but won't destroy it - still doesn’t stack up. Sure, she can do without the pennies Spotify throws her way - she made almost $40m in 2013 alone. But it paid her more than internet radio station Pandora and YouTube, where you can still listen to her older songs and watch all her music videos. It may not be a case of never ever getting back together for Swifty and Spotify, but at the moment the break up feels pretty bitter. ‘My hope for the future, not just in the music industry, but in every young girl I meet…is that they all realize their worth and ask for it,’ Swift wrote in the Wall Street Journal article, in which she lumped streaming in with the evils of piracy and file sharing. Fuzzy feel-good rhetoric aside, this feels like a power play on Swift’s part. She clearly understand the transformative power of the internet, but releasing videos on YouTube, using Twitter to connect directly with her 46 million-plus followers and inviting fans round to her house to bake cakes are all things she has direct control over. But the simple truth is that the music industry is not stuck in 1989. Streaming is the future and, unless you’re Taylor Swift, artists can’t just ask people nicely to buy their albums because, y’know, they’re worth it. Oh, and in the interests of full disclosure I am a Taylor Swift fan - just not enough of one to actually buy her music.